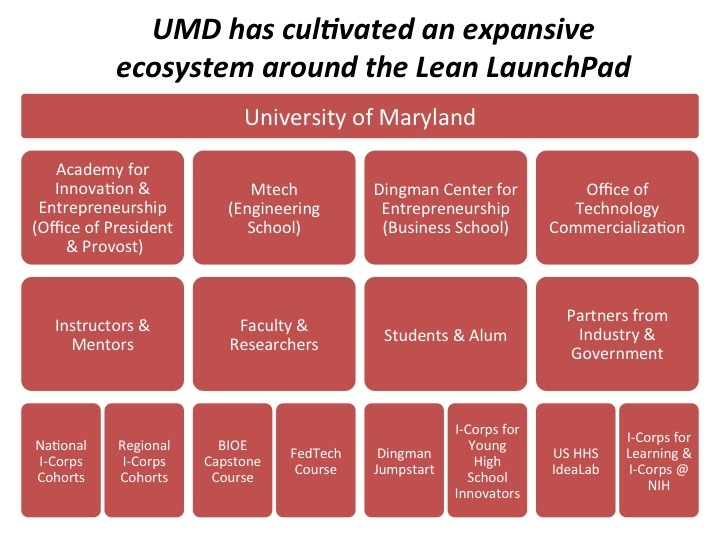 The University of Maryland is now integrating the Lean LaunchPad® into standard innovation and entrepreneurship courses across all 12 colleges within the University. Over 44 classes have embedded the business model canvas and/or Customer Discovery including a year-long course taken by every single one of its bioengineering majors. It’s made a big bang. Here’s the story from Dean Chang, UMD’s Associate Vice President for Innovation and Entrepreneurship. Two decades ago, Steve Blank completely changed the course and fortunes of a Stanford spinout startup called Immersion. I was lucky to be one of the very early people at Immersion and met Steve when he came on as one of our first board members. It was Steve who first brought Will Harvey to visit Immersion, which led to a strategic investment in There.com, Will’s stealth-mode but sure-fire, can’t-miss startup. We didn’t know it at the time, but with that investment we had paid for front-row VIP seats to witness the origins of Customer Development and the Lean Startup. There.com is where Will first met and hired Eric Ries and had the painful and formative experiences that directly led to them starting over and co-founding IMVU while auditing Steve’s Lean LaunchPad course. With Eric Ries as the first practioner of Customer Development, Steve wrote Four Steps to the Epiphany, Eric wrote Lean Startup, and – BANG – Customer Development and Lean Startup were born! Twenty years and 100,000’s of copies of those books later, my life has fortuitously intersected with Steve Blank once again now that we’ve both become educators. In my second go-around with Steve Blank, he’s still changing the course and fortunes of startups everywhere, but perhaps more profoundly, he’s now also changing the course of universities and students everywhere as a result of a program he developed with the National Science Foundation (NSF). The DC, Maryland, and Virginia (DMV) region represents the most fertile science and technology region in the country with about $30 billion in federally-funded R&D. However, the region has historically underperformed in translating its enormous R&D output into impact. When Steve and NSF created the I-Corps™ program in 2011, I approached Edmund Pendleton from University of Maryland, Jim Chung from George Washington University and Jack Lesko from Virginia Tech with the idea that together we could leverage the respective strengths of our institutions, and catalyze the region through I-Corps. In 2012, we applied for and then were awarded a grant from NSF to do just that. We created the DC I-Corps Regional Node to teach the Lean LaunchPad curriculum to top scientists, innovators, and students from around the country and from our region. Since 2013, DC I-Corps has trained over 150 teams with the kind of impact NSF and Steve envisioned when they launched the program. That impact is now accelerating with the DC I-Corps node’s addition of the #1 research university in the country (Johns Hopkins) in 2014. University of Maryland’s President Wallace Loh’s commitment to engage every student in all 12 colleges in innovation and entrepreneurship resulted in UMD aggressively leveraging its I-Corps and Lean LaunchPad experience inside undergraduate classrooms. Our FedTech class pairs students with some of the most promising technologies from NASA, DOD and several other of the 87 federal labs located in the DMV region. Federal labs like DOE literally have tens of thousands of inventions that they’d like to have vetted for commercial potential, so FedTech students search for a repeatable and scalable business model for those fed lab technologies using the Lean LaunchPad framework. Students get course credit, a fantastic learning experience, and in some cases, even a job offer or career opportunity with the federal lab or with an industry contact made during interviews. Elements of the business model canvas and/or discovery-based interviews of stakeholders have already been incorporated into 44 other classes at UMD. But the biggest impact of 2014 has been from incorporating the Lean LaunchPad curriculum into our signature, year-long senior capstone course in bioengineering. This means that every single University of Maryland student in the Fischell Department of Bioengineering is now required to not only design a real biomedical device but also take that design through rigorous, evidence-based Customer Development in order to graduate. Truth be told, we took a page out of Frank Rimalovski’s playbook at NYU and paid for Yang Tao to attend the Lean LaunchPad Educators Program. He’s the professor who teaches the bioengineering capstone course, and he returned from Steve’s ranch inspired and determined to weave the Lean LaunchPad into the fabric of the capstone course. So what’s happened so far? In this capstone course students visit the University of Maryland medical school and shadow doctors, nurses, and other hospital workers to learn about problems and needs, which is an ideal set up for customer interviews and discovery. They spend the year working with the doctors and the life sciences venture community to design devices and other solutions to those problems and needs. Before Lean LaunchPad was added to the bioengineering capstone class, some beautiful devices were designed and manufactured with many students never knowing whether the value proposition for what they made was beneficial enough to all the right people to warrant adoption or if the customer segment they targeted was the right one and made financial sense. Now the students spend time in customer discovery and learn why validating the business model for their device is so important. As they target the different parts of the canvas, they begin to understand how things like improved healthcare, purchasing, reimbursement, and regulatory must fit into a successful business model. Some students will find that their device is an engineering marvel but would never fly in the market for reasons they weren’t even aware of until they did their “outside of the classroom” customer interviews. Co-instructor Martha Connolly thinks that’s a perfectly good outcome because they’ve still learned the process of designing and making a biomedical device but they’ve also learned equally valuable lessons from the Lean LaunchPad process that will be applicable in any future endeavors, whatever they may be. The real proof of Lean LaunchPad’s impact is that the students are clamoring for it. In fact, two UMD bioengineering students, Shawn Greenspan and Stephanie Cohen, went through the capstone course last year before Lean LaunchPad was integrated. They were so upset that they missed out on the Lean LaunchPad version of the course that they teamed up with Dr. Ron Samet, a very entrepreneurial professor of anesthesiology from the medical school, to take the class through this fall’s National Science Foundation I-Corps regional program taught in the D.C. area. “I-Corps finally put us on the road to real customer discovery. Our initial business plan started with an incorrectly identified buyer, value propositions that were wrong, and guesses everywhere else. Fortunately after 67 interviews we now have a fully developed customer segment identifying each customer type, the key value propositions, and a developing revenue model. This kind of feedback from students is particularly gratifying. Not only did the experience have the kind of impact we had hoped for, but it’s also turned into a potential career opportunity for Shawn and Stephanie as they’re completing their master’s programs. to the U.S. Department of Energy’s National Clean Energy Business Competition. Being a node instructor in the I-Corps @ NIH program has allowed me to work with some terrific experts in life sciences and healthcare ventures and spread that expertise to DC I-Corps and UMD programs. Next month, I’ll be a node instructor in NSF’s upcoming I-Corps for Learning program where we aim to teach STEM educators how to scale their teaching innovations to a wider audience. That experience should again result in great learnings to bring back and apply at UMD. When I witnessed the Big Bang origins of Customer Development and Lean Startup 20 years ago during my first encounter with Steve Blank, I could not have guessed how fast it would impact the startup world, and now universities and students. If the past is prologue, the future is going to be fantastic! Talking about the theory of big bang, did you know that the theory has been written by someone in the 7th century ago. He wrote down the events exactly as what we now know. If you want to find out more, visit your nearest bookstore or search on google, and search about the genesis of the universe according to Islamic literature.